So it has been awhile since any huge royal wedding news broke. With the BIG day only weeks away, American companies are jumping into the excitement as Dunkin Donuts announced last week that they are going to have a special "Royal Wedding Donut" on sale April 24- April 29th nationwide. At 89 cents, this is one way we all can share in the William & Kate's joy without jumping across the pond. If donuts are not your cup of tea (insert British joke here), Baskin-Robbins, is introducing a commemorative Royal Wedding ice cream cake topped with white and blue roses. The cake is styled after "an English Garden." Is this tacky? Not as horrible as some of the actual products that have come out, you can be the judge of the weirdest one. Top contenders being the engagement picture covered refridgerator. Yes, you read that right. And the Will & Kate nail decals, in case you want ten images of the royal couple staring back at you as you go through your day. 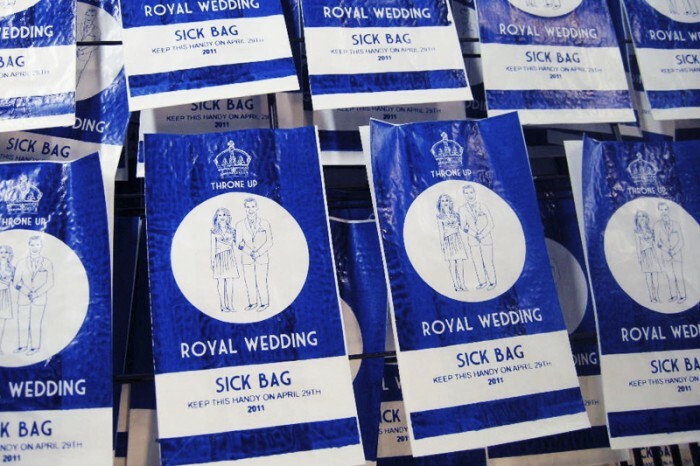 Or the royal wedding throw up bag, in case weddings really aren't your thing at all. So now the donuts and ice cream cake don't seem so weird, huh? So when you get overwhelmed with your wedding, just be glad that your face isn't on a throw up bag being sold internationally. Perspective can be a great gift, thanks royals!